The Herman bands were all 'road' bands and Woody spent almost his entire life travelling from Coast to Coast and touring Europe. One in a while though, an engagement of several weeks presented itself and everyone looked forwarded to the regular residence at the Hollywood Palladian. 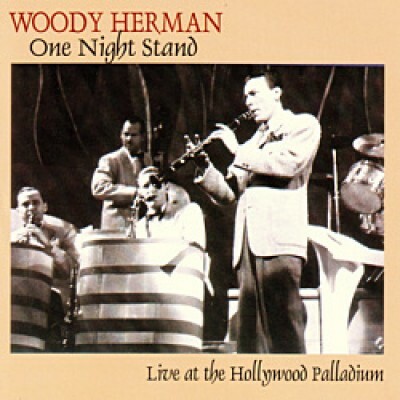 Here on these two atmospheric 'One Night Stand' broadcasts from the legendary venue in the Spring of 1951, we get a chance to hear typical programmes that Woody's working band played every night for dance concerts all over the USA. Featured arrangements by Ralph Burns, Shorty Rogers and George Shearing and highlights are solos by Phil Urso, Shorty, Urbie Green and Woody himself.